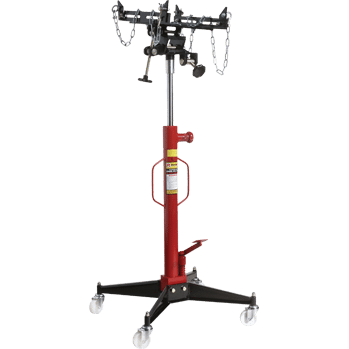 Compact, upright transmission jack with a maximum lift capacity of 1,100 lbs. Built with the same heavy-duty materials as the larger models, the RTJ-1100 allows you to safely and easily remove, transfer and install transmissions, transaxles and other drive-train components weighing up to half a ton. The unit features a built-in safety overload valve for your protection and a foot operated pump for hands free operation. Small storage area? No problem! The 24-inch base makes this one of Ranger’s most space efficient designs. Compare Ranger transmission jacks with any other brand and you will see why we’re America’s favorite.